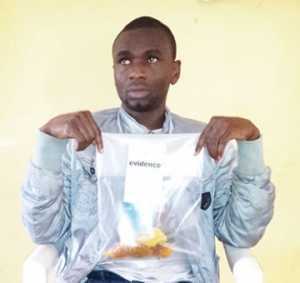 A 32-year-old undergraduate, Chizoba Nwabuwa, has been arrested by officials of the National Drug Law Enforcement Agency for ingesting 25 wraps of male condoms filled with cocaine. In a statement by the NDLEA’s Head of Public Affairs, Mr. Mitchell Ofoyeju, the agency said the arrest was made at the newly upgraded Akanu Ibiam International Airport, Enugu State. Head of the NDLEA, Enugu Aiport Command, Mr. Nsikak- Abasi Udoh, confirmed the arrest. He said, “Nwabuwa was arrested during the inward screening of passengers on an Ethiopian flight from Brazil. Chairman/Chief Executive of NDLEA Ahmadu Giade commended his men for the seizure.